I created the photo collage at the top of this blog post (above) back in early January 2017 for the first entry of the new year. Writing then about finding quiet spots of beauty and respite, gifts from the Divine that offer balance in chaos, I find now that the same collection of photos provides a proper pictorial introduction to the contemplative stream as Kern Road's current worship series dives into discussion of the six streams of spirituality about which Richard Foster writes in his book Streams of Living Water. All six of the historic faith streams source back to the life of Jesus; in last week’s introduction to the series, we discovered that new understandings of these streams will help us appreciate Christians who are different from ourselves. As we learn more about streams other than those with which we are familiar, we hope to grow more balanced and complete in our individual faith journeys. The contemplative stream (the prayer-filled life) focuses on nourishing one’s relationship with God and the inner life through prayer and contemplation. I am not surprised that natural beauty plays a significant role in the collage; the beauty of creation offers not only respite from chaos, but a replenishing space as well for the interior work to which many contemplatives are drawn as they seek to nourish their relationship with the Divine. 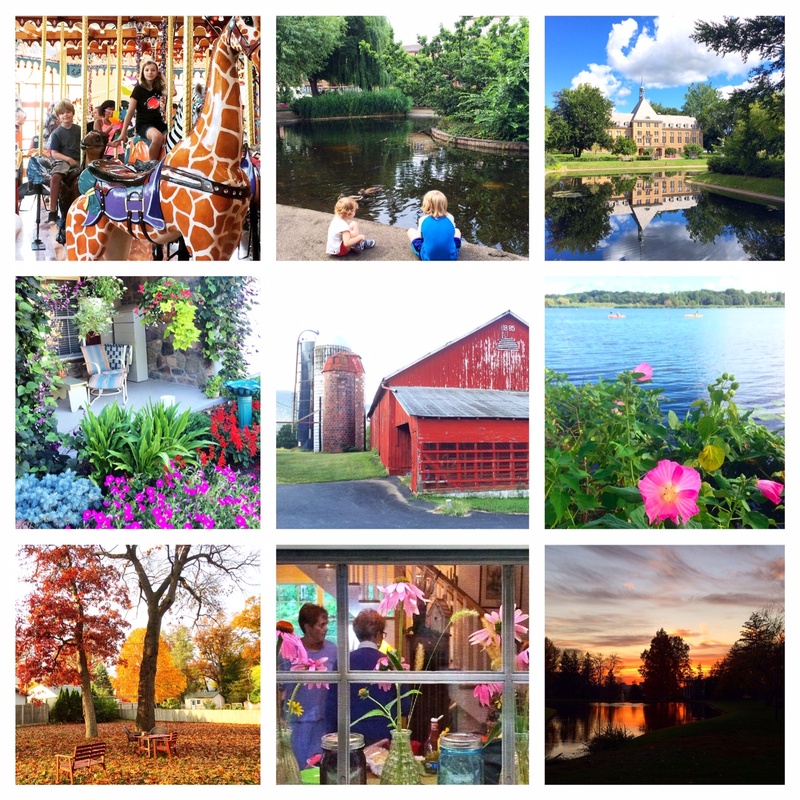 The evocative places in these photos from my life (from left to right and top to bottom) recall moments with local grandkids on a carousel in St. Joe, MI; with Michigan grandkids at Clapton Pond in London; on the Saint Mary’s campus with high school friends; admiring the front porch sanctuary of long-time friends in Lansdale, PA; with a KRMC friend taking in the beauty of her mom’s barn in Everett, PA; viewing with golf foursome women the glorious waterfront in Douglas, MI; enjoying my own backyard in South Bend; inhaling warmth through the window with small group friends at Grandpa’s Woods in Goshen, and appreciating the glory of a sunset overlooking my high school’s memorial garden in Lansdale, PA. I discovered in the process of receiving spiritual direction in the middle 90s that I was very attracted to contemplative, listening modes of prayer, and through regular use of those prayer forms, I found myself experiencing perhaps for the first time a sense of God’s unconditional love, so that what had always been pure head knowledge for me gradually became transformed into heart language. The silence that so threatened the author at first gradually became “a garment of healing” for Jones as he embarked on an adventure of self-discovery, recognizing in time that his capacity for thinking far outshone his capacity for feeling. The plunge into silence ultimately illuminated for him what he called the “elaborate, even skillful, intellectual defenses” he had established to keep feelings at bay. The experience of reading about self-discovery and finding God in the silence, even as I was immersed in a whirlwind trip through five countries in three weeks, impressed upon me a serious fascination with the impact of silence on one’s faith journey. The contemplative journey introduced me to authors like Flora Slossen Wuellner, whose writing taught me that healed wounds can become sources of new life and the channel of healing for others: that fear when healed becomes compassion, that destructive anger becomes a passion for justice and righteousness, that perfectionism becomes joyous power to build and create. I was fascinated by Wuellner’s declaration that “the warmth we feel through our whole selves, body and feelings, when we have dared to love, dared to give, dared to meet life with generous openness is the smile of God!” I remember the comfort it was to me to read that, as I had always assumed that warmth might be some sort of smug self-satisfaction! Not all people of faith will find themselves drawn to the contemplative way. For what it’s worth, here’s a link to Carl McColman’s Is There a Contemplative Personality Type? McColman suggests that “contemplation—wordless prayer in which we gaze on Jesus and the mysteries of his life with faith and love—is for everyone, regardless of your personality type. But how we enter contemplative prayer may vary based on our interests and preferences,” according to McColman. Does some part of you relate to the contemplative way of being or yearn to find connection to the Divine in the silence?